I was chatting with Donald Klippert in mid-January and he mentioned that he saw a white SOO gondola. We talked about the white SOO LINE paint scheme being a favourite of ours and then we got onto the SOO grain hoppers. I started digging through my photo collection and it turns out I have quite a few photos of them. I usually make a point of photographing a SOO car when I see one. So, without further ado, here are some SOO grain hoppers. The car below has the "Colormark" logo on it. According to this Trains thread, cars were colour coded based on the loading features for the freight cars. Apparently they stopped doing this on hoppers around 1974. Some of the "Colormark" cars don't seem to have a wheat sheaf (like this one or this one or this one). I wonder if they ever had a sheaf, or if it has just faded over the years. There are two number series for the round-side ACF Centerflow cars - the 74xxx and 76xxx cars. 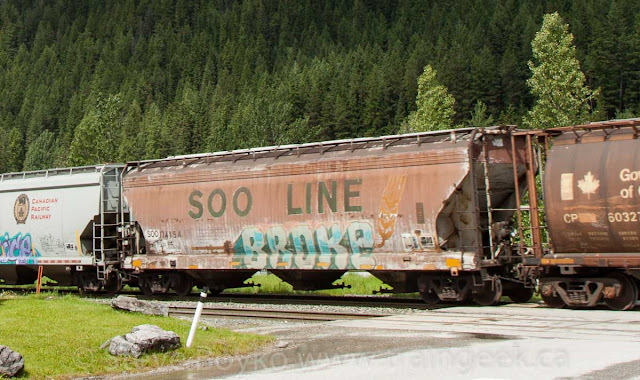 The 74xxx cars have a larger "SOO LINE" near the top of the car, while the 76xxx cars have a smaller "SOO LINE" vertically centered. In general they all seem to have had the gold wheat sheaf... with one exception below. 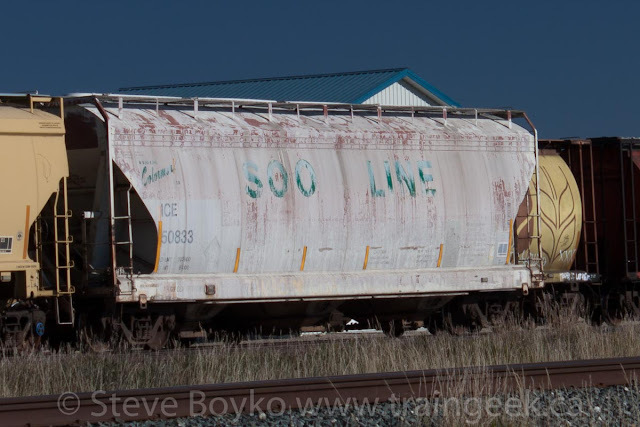 The flat sided SOO LINE hoppers seem to be in the 75xxx number series, with some in the higher 74xxx series (SOO 74582, SOO 74718, SOO 74953). They all seem to have the wheat sheaf, without exception. 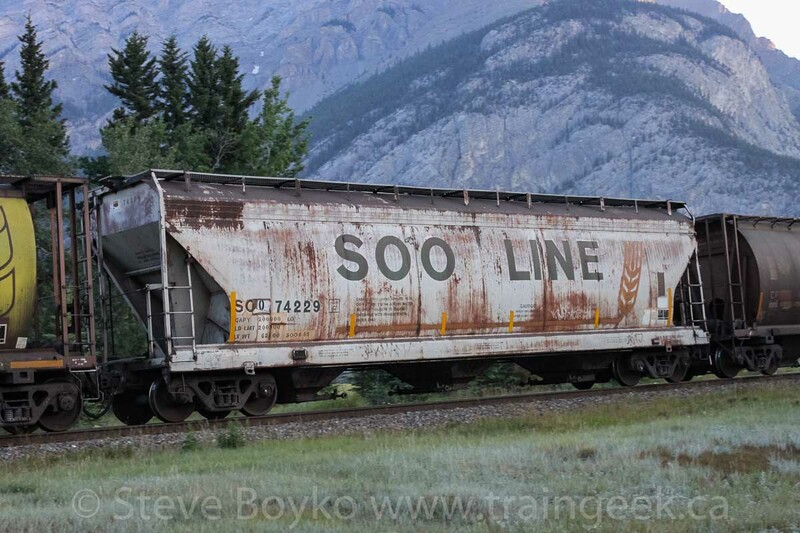 I invite you to click through to SOO 74289 to see a really different SOO LINE paint scheme. 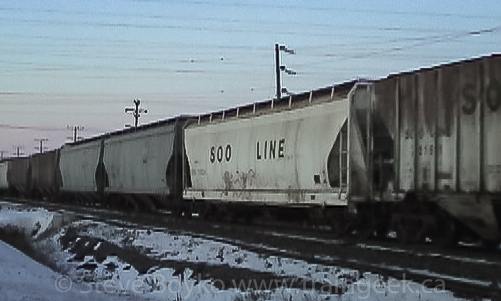 That's all the SOO LINE hopper photos I have! I hope these can provide some reference for freight car enthusiasts and modelers. 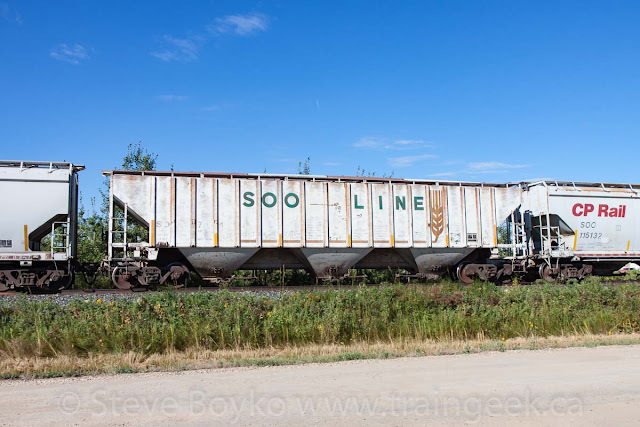 I'll leave you with this flat-sided SOO hopper - not a SOO LINE, though - land locked in Solsgirth, Manitoba. No wheels - no problem! I'm glad I was able to provide inspiration for this awesome blog article. I'm also impressed you were able to find so many photos of all the different types of cars, paint schemes and font sizes used. One doesn't see them that often anymore, at least not in Calgary. 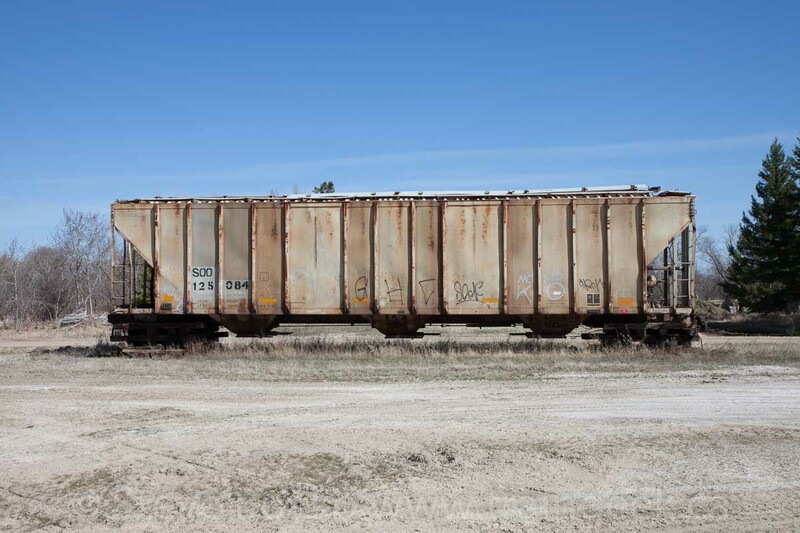 Perhaps, like the Milwaukee Road hoppers, they reached the end of their useable lives. CP is always eager to 'sweat the assets' including inherited cars like those of the SOO, DME and ICE, OTOH. 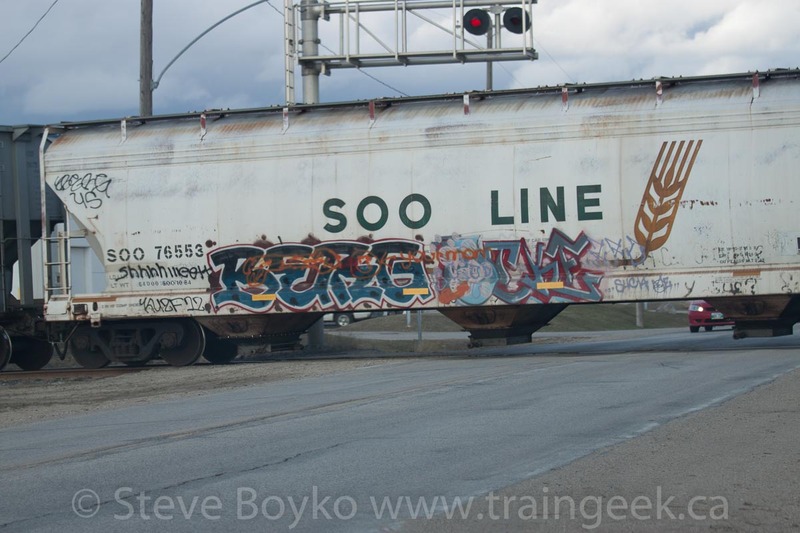 Soo Line cars never really disappear, do they? They just fade away! The Colormark P-S covered hopper produced by Athearn was always a favourite on my layout. And still is! Always great to see rolling stock articles on Confessions! Hey Donald, it was a fun chat and I'm glad it inspired me to share some SOO LINE photos. These cars are going to disappear eventually... hopefully not too soon. Hi Eric, glad you liked the article! It's people like you who have inspired me to keep looking at the train long after the head end has passed. Wow, that's an impressive collection of Soo Line hoppers. 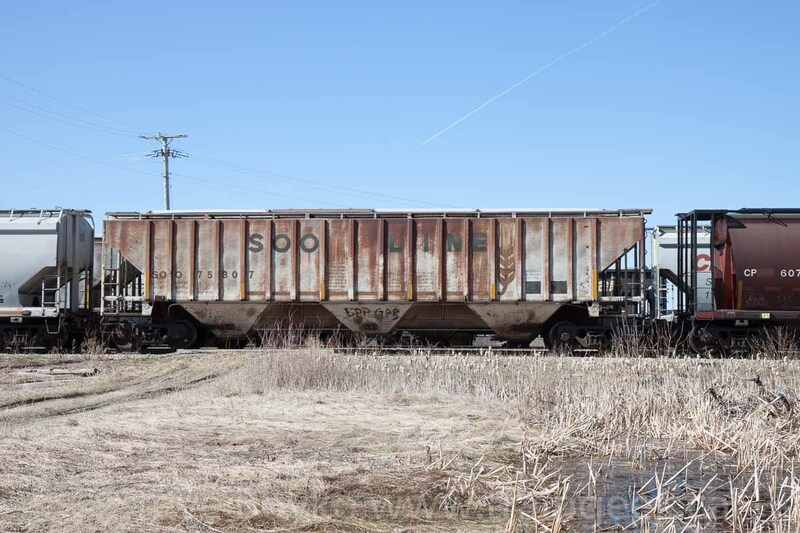 Hi Mark, I hope your hopper is a good match for a SOO LINE hopper! Thanks, Blair, I do like seeing and photographing them!